Colombian police say Pedro Guerrero, one of the country's most wanted men, was drunk when he fell into a river and died while trying to flee from police. Guerrero, known as Cuchillo ("The Knife"), led a 1,200-strong army and largely controlled the drugs trade in eastern Colombia. Forensic experts say the cause of death was probably drowning or a heart attack. Police had tracked him down to a ranch, where he was celebrating Christmas. Head of the Judicial Police Gen Carlos Ramiro Mena said The Knife died of natural causes while being pursued by the security forces. "He had run some 200m (650ft), he was drunk, he'd been drinking for many hours, and the river he fell into was deep and the water very cold," Gen Mena told Colombian radio. Gen Mena said the police operation had been long in the planning and they had foreseen he would try and flee. "We formed two security rings around the property, the first with helicopters and special operations forces, the second at a 3km (1.9miles) radius to prevent anyone from getting away," Gen Mena explained. He said his officers were met with heavy fire and that two of them died because they refused to return fire knowing there were many women and children at the ranch. The general said his officers had received very specific information from informants which led them to the ranch near Mapiripan, in Meta province. He said members of Guerrero's gang had decided to collaborate with the police and informed them about his every step. Defence Minister Rodrigo Rivera announced on Wednesday the informants would receive more than $2.5m (£ 1.6m) in reward money. Police said they found two pistols on Guerrero's body and that he was still clutching his trademark knife, with which he reportedly cut the throat of many of his victims. One of the pistols was gold plated and encrusted with diamonds, a trophy Guerrero allegedly stole from another paramilitary leader in 2003. President Juan Manuel Santos said Guerrero had become "a kind of legend, who's seen as untouchable, whom no-one could catch". "Well, here we have again proven that no-one can escape the determination and ability of our armed forces, in this case the police," he added. Gen Mena said almost 300 police agents took part in the assault. A bombing raid, similar to that which killed Farc military leader Mono Jojoy in September 2010, was ruled out because the informants had told police up to nine children would be present at Guerrero's Christmas celebration. One of Guerrero's bodyguards was killed shortly after police abseiled down from helicopters. Seven others in his group were arrested, among them Guerrero's number two, known as Madman Harold. 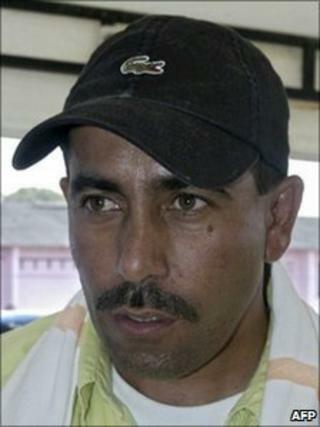 Guerrero was wanted on 15 charges, including drug trafficking, murder, torture, kidnapping and forced disappearances. President Santos said Guerrero could be responsible for as many as 3,000 murders. He led a right-wing paramilitary group until it was demobilised in 2006. Police say he then founded his own criminal group, the Popular Revolutionary Anti-terrorist Army of Colombia, which controls much of the drugs trade on the country's eastern plains. Colombian police say Guerrero had evaded 17 attempts to capture him over the past two years, something they say means he probably had his own network of informants which may have included members of the security forces. Colombian Police Chief Oscar Naranjo said that "without The Knife, Colombia would have a respite" from the killings and violence he had caused. But local officials in the east of the country were not as confident. Jose Arenas, the mayor of San Jose del Guaviare, an area where Guerrero and his men were active, said he welcomed the death of Guerrero, but remained sceptical it would make a difference. "If you don't tackle the causes, the dependence on growing coca, and the whole cocaine chain from the start to finish, you will just see a new leader emerging," Mr Arenas told Colombian radio.